I believe there is beauty to be had in the ordinary, simple, every day moments of life. Yet more often than not, my vision is cloudy. I rush here and there, with my eyes half open, only seeing the same old, mundane things that are right in front of my face. I long to slow down, to take time to really look and see the beauty that is all around me. I long to see His beauty. I need to learn to stop, to be still, and to be intentional at seeking it out. To truly see Him, my whole heart must be involved in the process. But most days, I feel as if I am looking at life with half a heart, while the other half is wrapped up in the busyness of every day. My desire is for the moments that take my breath away, for those moments which cause me to stop and say “wow, how beautiful”. Yet at the same time, I realize there is beauty to be revealed in the messes of life, in the piles of unfinished laundry and the dirty dishes in the sink. A flower may look like an ordinary flower, but given a closer look, I may notice the lady bug that has settled in the center. The sun may look the same to me every day, but I might take the time to notice how the light from its rays changes the color of my daughter’s hair. I may go to the same job every day, but I don’t want to miss the beautiful gifts that await me there. This year, I want to be intentional at seeking out the Giver of gifts, and uncovering the treasures that lay beneath the surface of my life. I thought perhaps I would begin my counting with Ann’s Joy Dare prompts. But for me, it was actually harder. I found myself scrambling for subject matter and thus missing the beauty of “eyes wide open seeing”. So I will count. I will count to see His beauty. I will share my gifts with you every week. I may share three. I may share five. I may share 10 or more. The point is not in the number of gifts, but in the seeing. In order to see beauty, one must open their eyes. I think I’ve been living with my eyes half open. My prayer is that God would awaken my heart, my mind and my eyes to His beauty. *Hot coffee on a cold morning. *Youngest son playing basketball outside laughing with joy. *The power of God’s Word. *A new church building (we move in two weeks)! *New paints for creative expression. *Friends who love me through the hard seasons. *Blogging friends who give me courage to dream. *Grace for homeschooling (which I need lots of right now). How about you friend? Are you counting your gifts? I would love to visit your list. If not, share one thing below that you are thankful for. 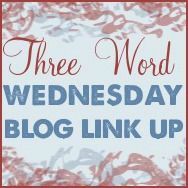 Linked up with Beth for Three Word Wednesday. Also Linked up with Kelsey for New Every Morning. I am with you on this! What a great inspiration for the year. I also love your list. After 25 years of home schooling I can understand that need for grace, but I must say, I sooooooooooooo miss it. It hasn’t been fun to be forced to stop, but God is adjusting me. May you see the beauty all around…even a clean kitchen is beautiful, or a teen boy’s messy room, because it reminds me that we have sooooooooooo few years left with him being at home. I’ll be praying for you. We are actually putting my daughter back in school next year, but will homeschool our son in two years when he enters Jr. High. Have a blessed week Janette. Beautiful post Barbie! Did you know that ‘see’ is the writing prompt today for Five Minute Friday? It would fit perfectly. Thanks Deb! I loved that the FMF prompt was see. So fit with where I am this week. Blessings! Oh I have a fix it hubby at home too. I don’t know what I’d do without him! Blessings! Thank you for stopping by Carolyn! Visiting from the New Every Morning link-up! “The point is not in the number of gifts, but in the seeing.” This is spot on! I am finishing up reading One Thousand Gifts this week, and I continually find myself wanting to write down oh-so-many gifts… but then am I truly thankful for them? Or am I just trying to fill the page in my journal? I’m also asking the Lord to bring to mind things from the past that I have overlooked or forgotten without gratitude. I want to redeem the time lost! Looking forward to reading your list — however long it may be — each week. Blessings! Thanks for stopping by Kayla! I look forward to visiting your blog and reading your list as well. I started to read Ann’s book last year but never finished it. Her style of writing is almost hard for me to comprehend, although so beautiful. I started my 2014 reading list with her book and intend on finishing it. Look forward to counting blessings with you! Oh friend, I will be praying for you. I felt so defeated last year when I was counting. I felt like I was comparing my life to those of others. I really want God to open my eyes this year, to see my life and all that is in it as a blessing. I am hoping you have some peace in your current situations at work, home, etc. Thankful we are counting together! Today I cannot swallow… it’s a long complicated issue that I hope can be treated soon, but for today I CHOOSE to see the blessing in the fact that I have drinks that can meet my nutritional needs. I have caregivers who ensure that I am getting those drinks, and I have the money to purchase them. Shelly, I am praying, asking the Father to bring complete and total healing to your body. It’s so encouraging how to CHOOSE to see the blessings all around you, despite your currently circumstances. Love Jeremiah! Thankful to be able to link up. Looking forward to counting our blessings together. Mmmmm, ginger-peach tea! Sounds amazing. Have a blessed weekend. Moving in two weeks?!! How nice! I’m seeing God’s hand of love in the blanket of snow that is covering the ground. As the temperature dips, He is protecting our water lines with the insulation of a good, thick snow covering. I love how you see His blessings my friend! Have a blessed weekend. A great big AMEN to that! I am looking forward to that day! “The point is not in the number of gifts, but in the seeing.” Amen, girl! Words I needed to read today. I’m so grateful we are doing this together and LOVE that you are sharing your gifts with Three Word Wednesday. Your heart is truly beautiful and so are you. I’m praying for you. And praying for the day we share a cup of coffee in person. I’m having to get creative with my post titles in order to make them fit, but hey, I could use “counting to see” every week and just add a twist or something 🙂 LOVE that we are in this together! Thanks for your prayers. Praying for you too! Oh and YES, we absolutely will share that cup of coffee! Today, I am thankful for my husband’s birthday. He took the day off work and we will be celebrating with our two children who are still at home. Happy birthday to your husband! Have fun celebrating.